During Thursday's House speaker election, Nancy Pelosi had an enthusiastic cheerleader at her side: her granddaughter Bella. WASHINGTON -- As Rep. Nancy Pelosi cast her vote during the election for the next speaker of the U.S. House of Representatives, she had an enthusiastic cheerleader at her side: her young granddaughter, Bella Kaufman. During the Thursday vote, Kaufman held her grandmother's hand as she jumped up and down excitedly. "Pelosi!" she shouted to delighted laughter from others in the chamber. Kaufman was one of 16 members of Pelosi's family present for the speaker vote, ABC News reported. Many legislators brought family members into the chamber for the opening session of the 116th Congress. 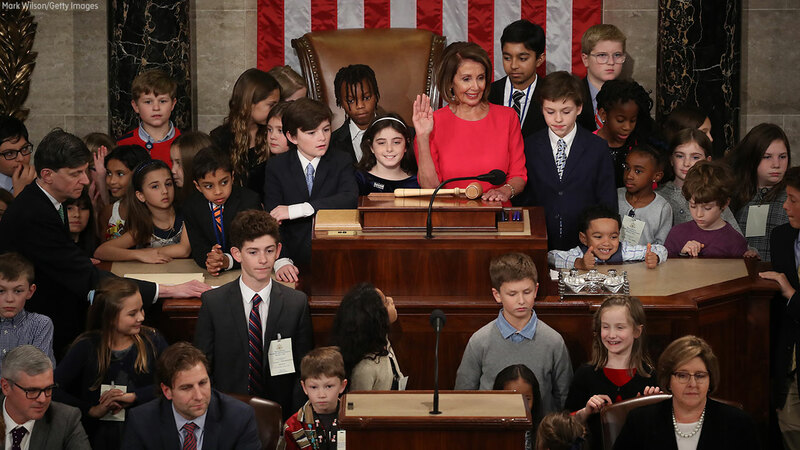 Rep. Nancy Pelosi stands with her grandchildren and other children as she takes the oath of office to become Speaker of the House during the first session of the 116th Congress. Pelosi was elected in a near party-line vote, making her the country's most powerful Democrat as the party begins two more years of confronting President Donald Trump. Pelosi's Democrats will be able to set the House's legislative agenda and conduct investigations of the Trump administration that Republicans shunned when they held the majority. Thursday's vote restores Pelosi to the post the Californian held from 2007 until 2011. She's the only woman to ever hold the chamber's top job. Pelosi reclaimed the job after Democrats gained 40 seats in the November elections, their biggest pickup in four decades.